Covering over 530 acres with just over 700 homes in a wide variety of price ranges, Lake Forest is one of Central Florida’s larger luxury communities. 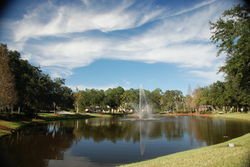 Gated and guarded 24/7, Lake Forest is located just off 46A in Sanford, 2 miles west of Interstate 4. 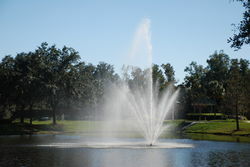 This NTS planned community has earned several major awards including both Best Community in Central Florida and Best Community in the Southeastern United States. The homes in Lake Forest range from large fully custom to modest production-built. In addition, vacant building lots are available. At its heart is a pristine 55 acre lake which allows for both fishing and sailing. Other amenities in Lake Forest encompass a lakeside pool and recreational area which includes a heated spa and kiddie pool. Showers, lockers and the full scale fitness center are in the adjacent clubhouse. The Lake Forest Clubhouse covers just less than 10,000 sq ft and includes a full sized kitchen and dance floor. Rounding out the amenities are six lighted tennis courts and a full sized playground for the kids. Lake Forest hosts a variety of clubs including: the Gourmet Club, Tai Kwon Do Club, Book Club and the Helping Hands. If you would like to tour Lake Forest or any other community - contact us!